World Motorcycle Day: Bajaj announces new riding clubs | IAMABIKER - Everything Motorcycle! Recently, Bajaj conducted the Pulsar Festival of Speed, India’s first speed biking festival, which turned out to be a huge success. Bajaj also launched Pulsar Mania, a stunt show, back in the past. Now, on the occasion of World Motorcycle Day, Bajaj has decided to launch two exclusive riding communities for its Pulsar and Avenger motorcycles owners. The Pulsar riding community is named as the Pulsar Maniacs and the Avenger riding community is called The Avenger Gods (TAG). 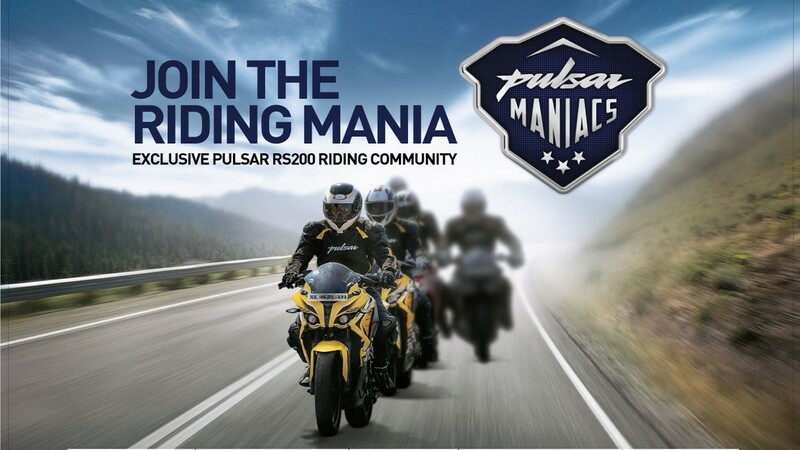 The Pulsar Maniac riding community is only for Pulsar RS200 owners and not for the entire Pulsar lineup. On the other hand, the TAG is for the Avenger owners. Bajaj will be conducting professionally organised rides for both the groups. These rides will be supervised by expert riders from the company. Bajaj will also be providing safety gears and/or emergency support for both the communities. The rides will include breakfast rides as well as long distance rides. For the Avenger riders, the first breakfast ride of The Avengers Gods was flagged off on 23rd June. To begin with, there will be a total of 15 Avenger riders who will experience riding from Chandigarh to Tirthan valley and back, covering a total of 700 kms. Also on offer is a total of 3 nights 4 days stay with activities such as Stargazing, Trout fishing, Forest trail, Bonfire & Barbeque with some local tribal music. Bajaj will start professionally supervised group rides on the Pulsars and Avengers in 7 metro cities which include Delhi, Mumbai, Bengaluru, Chennai, Pune, Hyderabad & Kolkata. The starting rides will be weekly rides and then later they will be expanded in the future. It is good to know that manufacturers are thinking out-of-the-box. The World Motorcycle Day is celebrated every year on 21st of June and is a great day for the entire biking community across the globe. Bajaj has taken a well-thought step to appreciate the growing biking culture in India.